The protest was sparked by the deteriorating security situation in Kunduz, where two districts were seized by the Taliban in recent months. Civil society activists and youths launched a peaceful protest in the northern volatile province of Kunduz last week. The protesters — which included women, religious scholars and students — had gathered to demand greater stability in the province, jobs for all qualified youths, and accountability from members of the province’s Lower House of Parliament, regarding their performance over the last four years. The protest, which began on Wednesday, continued overnight and into the next day, after demonstrators installed tents. The protesters were responding to the deteriorating security situation in Kunduz over the last couple of months, as two of the province’s six districts, Archi and Chardara, have turned from Afghan to Taliban rule. Residents of Kunduz believe that weak governance in Afghanistan is to blame, and launched the protest to show their anger in the face of the worsening situation. 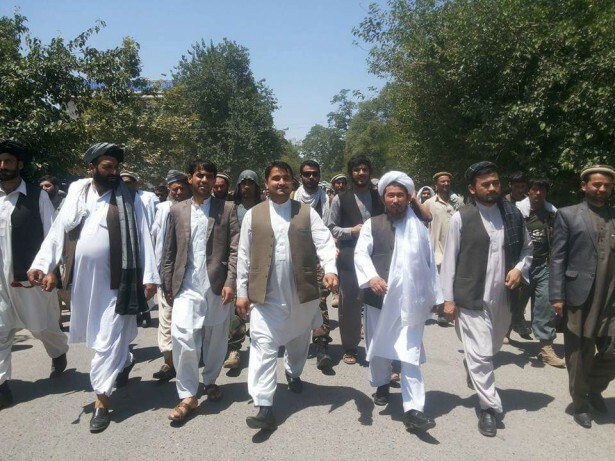 According to one of the protest leaders, Abdul Ghafor Hotak, the provincial governor of Kunduz, along with several provincial council members, visited the protest site on Thursday, promising to take their demands to Afghan President Ashraf Ghani. The parliamentarians also promised that they would report their past performance to the people of Kunduz in 20 days. The protesters, however, are prepared to resume their efforts on a wider and larger scale if their demands go unmet. it is the important factor for civil society to protest and demand peace in their towns, cities and villages with peacefully from government. i appreciating the efforts of Ahmadullah Archiwal saib..